The stock hit a new high of Rs 700, up 6 per cent in early morning trade, surpassed its previous high of Rs 679 recorded on January 17, 2019 on the BSE in intra-day trade. Shares of Axis Bank hit a new high of Rs 700 apiece, up 6 per cent on BSE in the early morning trade after it reported over two-fold jump in net profit to Rs 1,680.85 crore for the third quarter ended December 31. The stock has surpassed its previous high of Rs 679 recorded on January 17, 2019, on BSE in the intra-day trade. The private sector lender posted a growth of 131 per cent to Rs 1,681 crore on the back of strong growth in non-core income due to recoveries and stake sales. It had posted a profit of Rs 726 crore in December 2017 quarter (Q3FY18). Net interest income (NII) grew 18 per cent year-on-year (YOY) to Rs 5,604 crore during Q3FY19 from Rs 4,732 crore in Q3FY18. Analysts on an average had expected a profit of Rs 1,245 crore on NII of Rs 5,364 crore for the quarter. The bank’s assets quality during the quarter under review improved sequentially with gross non-performing assets (NPA) and net NPA levels were 5.75 per cent and 2.36 per cent respectively, as against 5.96 per cent and 2.54 per cent respectively as on September 30, 2018 (Q2FY19). Management’s positive commentary on asset quality allays fears of any kitchen-sinking in the near term. Residual SUUTI stake sale, if any, could be a minor irritant, analysts at Emkay Global Financial Services said in result update. “We like the new managing director’s strategy to plug management gaps/inefficiencies, overhaul risk architecture/underwriting practices, embed conservatism in internal policies/practices, and focus clearly on profitability/sustainability, which if executed well, will be a long-term positive for the bank as well as for the investors”, the brokerage firm said with ‘buy’ rating on the stock and target price of Rs 780 per share. “With NIM expansion, lower credit costs and the bad asset recognition cycle behind, cost optimization in branch network and digital footprint, we expect the RoA to expand to 1.1% by FY21. While the management has only laid the broad framework, we await more granular strategy including human resource appointments, but the conservation background of the new MD comforts us,” analysts at Dolat Capital said in result update. The brokerage firm maintains ‘accumulate’ rating on the stock with target price of Rs 760 per share. 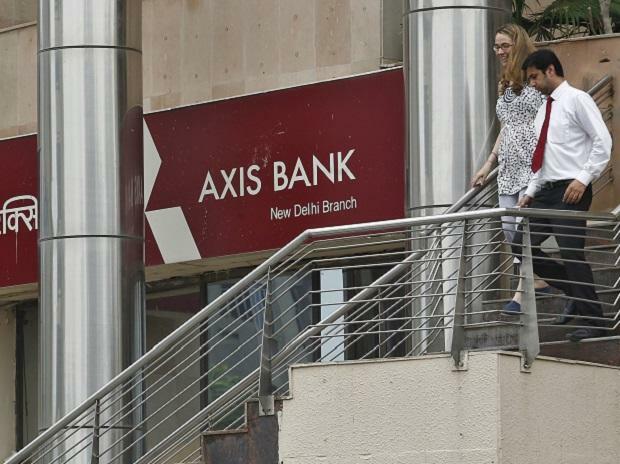 At 09:32 am, Axis Bank was trading 5.4 per cent higher at Rs 696 on BSE. In comparison, the S&P BSE Sensex was up 0.46 per cent at 35,757 points. A combined 9.46 million equity shares changed hands on the counter on the BSE and NSE so far.